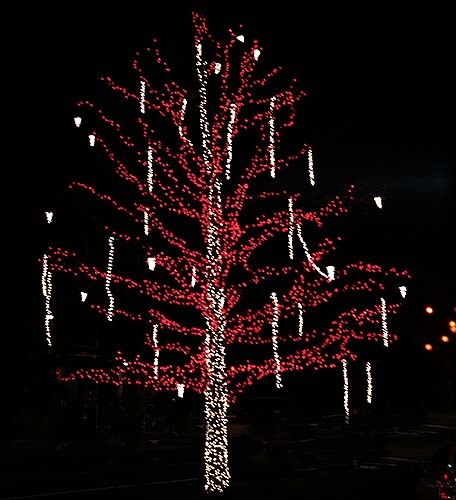 Take care of your trees when putting up Christmas lights. Don’t put holes in the trees it can cause great harm. Christmas is here again, and its time to put up all those wonderful Christmas lights that make the season so endearing. Not of course as much fun for the person out in the freezing weather trying to string up the lights. When putting up your decorations do consider the trees too. Its not that much of a Christmas present for them if you start putting nails, screws or other nasty sharp objects into them. Mostly we don’t think twice about grabbing a nail and thumping it into a tree but it can cause a great deal of damage to some trees. It can even, over time kill the tree. The bark of the tree is like its skin. If someone stuck you with a sharp object I doubt you would love them for it especially if it was just so they could hang a few decorative lights on you. If your skin is pierced you can get infected. Its why we wash cuts, put Neosporin or some other disinfectant on them and put on a bandage. Trees don’t have that luxury. They get a hole stuck in them they cant do anything to help themselves. Often the person could be using a nail or a hook that has been hanging around in the garage for goodness knows how long, kicking around in an old box. Heaven knows what’s on the thing but its certainly not clean. Now all the junk is in the tree. When you nail into a tree you go through its ‘bloodstream’ so any infected particles can be quickly transported to different areas away from the original site. 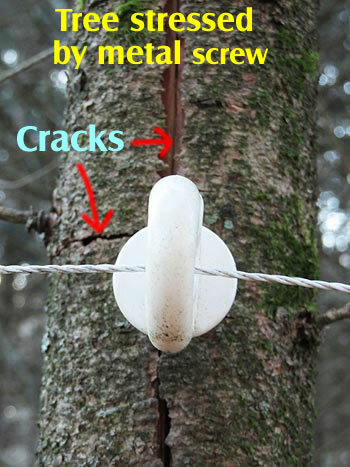 Tree cracked by having metal screw forced into it. This tree is dying. Also the bark is now penetrated and other infections can get into the wound. During the summer months most trees can produce more sap (their blood) with their own brand of antibiotics and try and fight off any incoming infections but during the winter months their system is pretty sluggish so they can do much to stifle the wound. Even if you take the nail or hook out after Christmas – which most people tend not to do – the wound is still there. Come spring when more diseases start waking up there is an open wound to allow them to enter the tree. Some tree species are stronger than others at dealing with this. In many cases conifer trees can be more susceptible to disease. Maples are less likely to succumb as their sap rises early and contains antibiotics that can help to kill any problems. This is the reason that maple sugaring is able to take place. Although good maple syrup tree tenders do try and keep their trees clean and free of diseases during the summer months and the taps they use are always disinfected to reduce or eliminate infection before they are used. 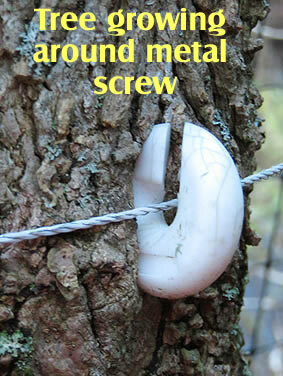 Tree growing around metal screw in an attempt to keep out infections. Often trees with high saps or gums can cope very well and often will actually grow around the nail or hook if it is left in the tree. This is not only because the tree is growing but because its trying to protect itself and seal the hole that has been created. In many cases a wounded tree can eventually die. It may take several years but once its compromised then all manner of diseases and insects will turn up to colonize it. In most cases boring insects, ants and other tree attacking insects wont harm a perfectly healthy tree but they will quickly find those that are sick or fighting off some infection and attack. Now suddenly the tree is not just fighting off one little nail hole with a few organisms it dealing with a whole bunch of different things. The tree cant cope with that, it struggles and tries but in the long run it usually looses the battle. Introducing diseases into trees by making holes has always been a problem, it has never been too serious in many areas. For the most part trees are used to losing a branch now and again or being scraped by animals. They do have some immunity. However in the last decade or so we have seen a great surge in global commerce. Goods are being brought into almost any area from all over the world. Along with those goods come diseases from other countries, either in the wooden packing crates, packing material or just as a dusting on some goods items. These new diseases and insects like their new environment and find trees to their liking that have no immunity to these new invaders. Such diseases can quickly infect wounded trees and in some cases kill very quickly. So use string, wire clips, anything that does not penetrate the tree bark. If you are hanging something from a branch that will blow in the wind put something around the branch to ensure that the bark does not get rubbed off. Pieces of old hose pipe are often excellent for this job on small branches. Larger ones may need sections of cloth or whatever you have on hand to protect the tree. If you value your trees don’t put holes in them. Keep them healthy and happy this Christmas season. Previous Previous post: Water Your Shrubs Before Winter Sets In.